If you are interested in Bitcoin or Blockchain, you need to listen to the best in the business. And what better than bookmarking the best blockchain & Bitcoin podcasts to listen in your leisure. Anyways, it doesn’t matter how and when you consume these podcasts but listening to them is the key to stay updated. Grab your headphones, open a podcast app, listen to some of the smartest people in the world discuss the thing they’re an expert in at 2x speed. We have some absurd advantages over past generations. I like podcasts a lot and often listen to some of the best cryptocurrency podcasts while driving or doing my household chores. Believe me, it is fun. But let me tell you some podcasts are excellentshitty ones and try to influence you in the wrong manner by subtly giving you investments advice. Of course, investment advises are not wrong but taking it from professional advisors is the best thing to do. So be wary of such self-serving advisors and only listen to quality Bitcoin and crypto podcasts to level-up your knowledge on blockchain and cryptocurrencies. That’s why today to aid you, I am sharing my bookmarked list of podcasts on blockchain and Bitcoin offered by some of the leading industry experts. Also, known as LTB is released twice weekly where you will get to listen to ideas, people and projects that are making the tomorrows digital economy. Each episode features insightful analysis of pressing topics in a fair way and probing interviews with the people that make things happen. It is hosted by Adam B. Levine along with Stephanie Murphy, Jonathan Mohan, Andreas M. Antonopoulos and if you like intelligent conversation and insightful commentary than do join Let’s Talk Bitcoin! Want to know what Wall Street and crypto veterans are thinking about the blockchain and cryptoassets? Then this is the podcast to listen. Here the host Anthony “Pomp” Pompliano-Founder & Partner at Morgan Creek Digital (a digital asset index firm) talks to some of the most respected names in crypto and Wall Street to find out how intelligent investors from the new and old financial system are thinking about digital assets. This is another outstanding podcast series on Bitcoin, cryptocurrency and blockchain innovations happening around us. However, its name is very intriguing but don’t get surprised as it is on the positive side. WhatBitcoinDid is produced by cryptocurrency trader and miner, Peter McCormack, where he interviews leaders from across the crypto economy. Expect to hear from crypto traders, miners, venture capitalist, investors, technical developers, CEOs, journalist, and other people driving forward the growth of cryptosphere. And my favorite ones are with Zac Prince on the Future of Banking With Bitcoin and The Threat of Fractional Reserve Bitcoin from Wall Street with Saifedean Ammous. I believe blockchain is redefining trust and so does the host of this podcast Laura Shin who talks to industry leaders across tech, financial services, health care, government and other sectors about how the blockchain and cryptocurrencies will open up new opportunities for everyone. And it is also required because blockchain is ready to change every trust-based interaction of our lives, from financial services to identity, from health care to the Internet of Things. 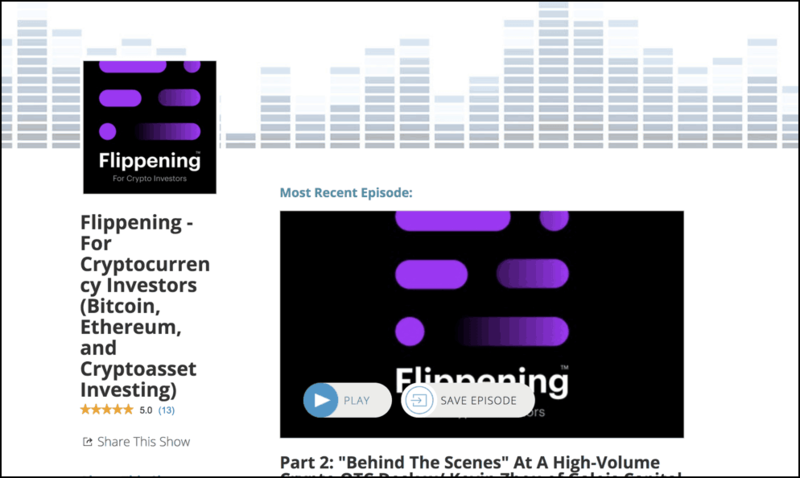 Flippening is a Podcast for Full-time & institutional crypto investors sponsored by Nomics’-a free cryptocurrency & Bitcoin API. The podcast hosted by Nomics™ CEO – Clay Collins and is published every Thursday with conversations from the top analysts, fund managers, market makers, and liquidity providers. So if you are interested in teach-ins with top crypto attorneys, accountants, and regulators and want to deep dive into market overviews with exchange and OTC desk operators, this for you!! This is my another go-to podcast for all things Bitcoin. Trace Mayer– the host of Bitcoin Knowledge podcast is an entrepreneur, investor, journalist, and monetary scientist on the subject of Bitcoin. 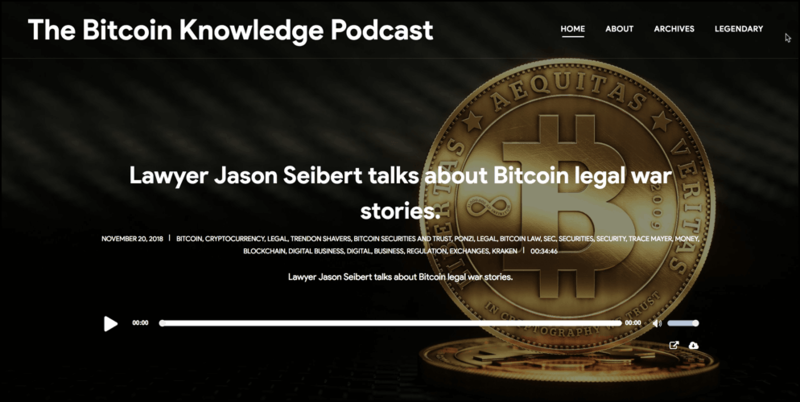 To help you understand Bitcoin, Trace interviews the top industry people of the Bitcoin ecosystem on the Bitcoin Knowledge Podcast. He is also an early promoters of Bitcoin back when Bitcoin wasn’t even a $1 and since then he has been contributing through various ways into the ecosystem. So, his is a must-listen podcast for you. One of the oldest podcasts of this world as it started in 2013 by Brian Fabian Crain and Sebastien Couture who met through Let’s Talk Bitcoin. Formerly known as ‘Epicenter Bitcoin’, Epicenter is the new rebranded podcast for all things blockchain. It is now my go-to podcast to weekly enjoy interviews with some of the brightest and most influential minds driving the blockchain and distributed technology revolution. World Crypto Network is an independent media company that aims to bring latest and up to date news on Bitcoin and cryptocurrency right in your ears. WCN (World Crypto Network) is comprised of cryptocurrency and Bitcoin enthusiasts who bring talks from Bitcoin developers, Bitcoin advocates, exchange founders, and DApp creators for you. There is no particular host for this podcast as many enthusiasts keep podcasting other industry leaders from every nook and corner. 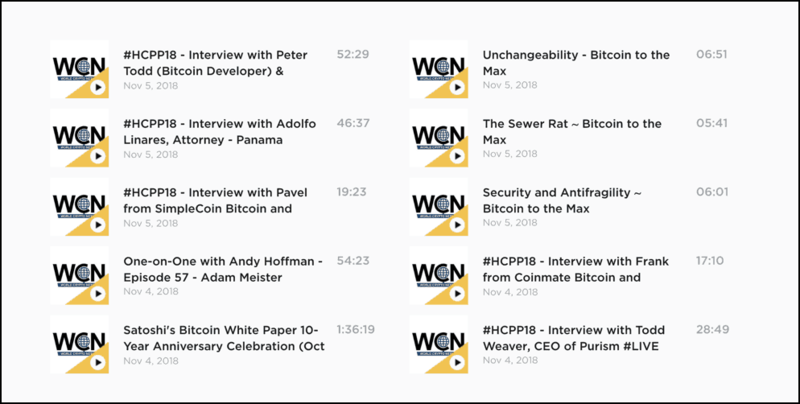 And to be honest, I like this way of democratizing and distributing the podcasting of this space as you get to listen to various thought processes in each episode of WCN. 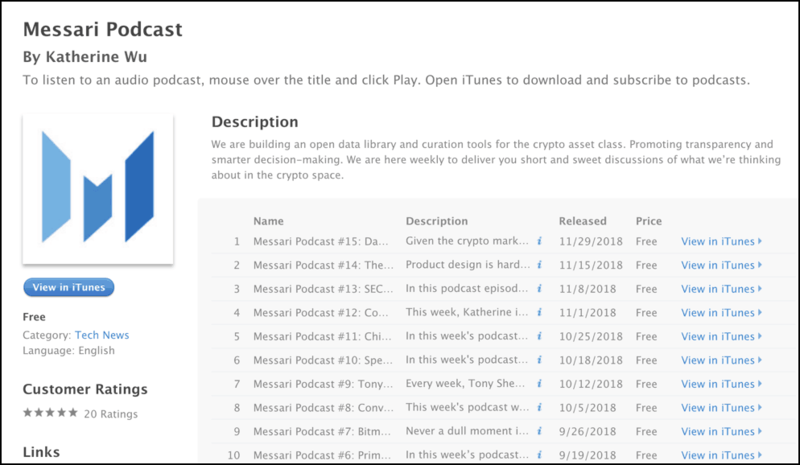 Katherine Wu hosts Messari podcasts weekly to deliver you short and sweet discussions of what they are thinking about the crypto space. Messari is building an open data library and curation tools for the crypto asset class to promote transparency and smarter decision-making in this space. If you are just beginning and are intimidated by the terminologies of the cryptosphere? Then this podcasting series is for you. 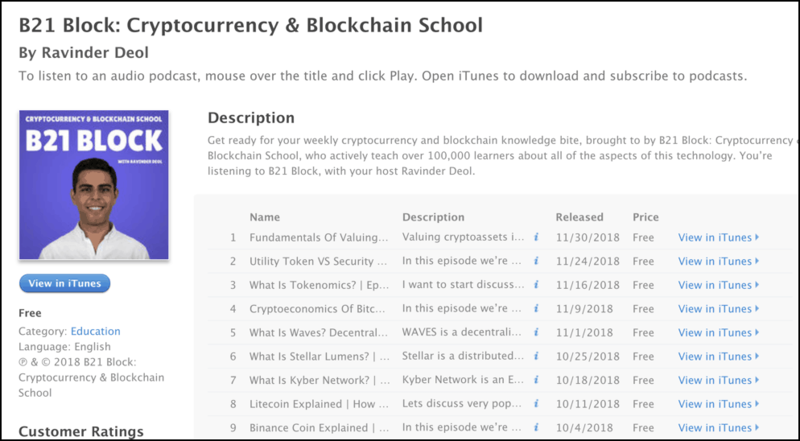 At B21 Block: Cryptocurrency & Blockchain School, a blockchain podcast for beginners, is hosted by Ravinder Deol where you can expect to learn weekly about the basics of cryptocurrencies and blockchain. You will also hear short introductory level reviews of various blockchain projects like Litecoin, Binance Coin, Kyber Network, etc. Listening to podcasts is a good way to stay updated about the latest opinions from the thought leaders of any industry. Crypto and blockchain are no different. So these were my doses of crypto and Bitcoin podcasts that I consume often. And why not also? When you get such awesome free blockchain education to stay updated.